Well-placed sources tell us that New Line Cinema may finally be getting around to making a feature-film adaptation of the graphic novel, Y: The Last Man. Of course, when a project has been in development for almost a decade, it can sometimes be difficult to get excited about the latest twist or turn. But even still, we hear that the studio is very pleased with a draft from former Jericho writers Matthew Federman and Stephen Scaia, and has already begun the process of meeting with director candidates to hire for the project. For those unfamiliar, Y is a classic in the comic book–graphic novel world. 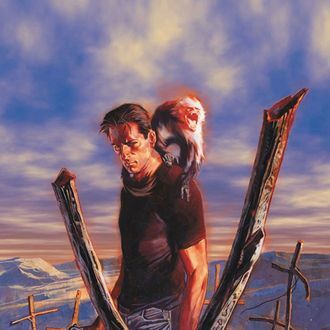 Written by Brian K. Vaughn (who also worked on several seasons of Lost), it tells the story of a guy and his pet monkey — the only survivors of the apparent simultaneous death-by-plague of every male mammal on Earth. Over the years, it’s attracted all sorts of directors, including most recently, Disturbia director DJ Caruso, who left the project two years ago.